Lilly's Life: You don't need snow to have a White Christmas! You don't need snow to have a White Christmas! My favourite Christmas song is Bing Crosby's White Christmas. Every December, I play it over and over which is a little 'delusional' given that I live in Australia where it's summer and Christmas Days are always warm. I haven't let a lack of snow get in the way of living the dream. Snow is just a small detail that can be overcome......with white sand. Strangely, Bing's dulcet tones don't seem to have the same effect on my neighbours, friends and family. In fact, he seems to make them lose that loving Christmas feeling. I don't have a problem listening to Bing 400 times a day so why should they? By the time the 25th rolls around we've all probably heard White Christmas close to 10,000 times. Hardly excessive is it? This year, White is part of my Christmas theme. Yes, you read that right. I colour co-ordinate most things in my life, even Christmas. Clothes, food, decorations.... I'm kind of peculiar like that. Most people cannot understand my need to do this. It's just me. I'm not sure that this is the kind of White Christmas Bing was intending either but....inspiration comes how it comes. We're all different. So over the weekend I was busy creating....after all, I had some serious catching up to do. There wasn't a hint of tinsel, glitter or razzmatazz in sight. 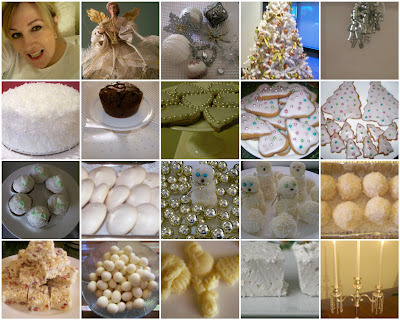 These pictures are a glimpse of my White Christmas efforts. After my redistribution mishap with the glass doors, I can safely tell you that I've bounced back. In fact, after my baking weekend, with its obligatory taste testing, I have bounced further than I had hoped and I now resemble a Christmas bauble. Probably another session with some glass doors, post Christmas, may be in order. Just click on the picture if you want to see a bigger version. No, not of my new shape, I mean my Christmas efforts. 1. Getting into the Christmas spirit.....finally. Caught in mid song ...well you know what I would have been singing while decorating the tree 2. The Angel that sits on top of the Christmas Tree 3. I collect one, and only one decoration each year which means I have 25 in total from all round the world (that number could possibly be stretching the truth considerably). I only collect white, silver, gold or crystal decorations. The only exception to this is the family name baubles. There is a bauble for each family member with their name on it (even those no longer with us like grandparents). 4. Christmas tree - I have used a combination of real, and 'fake' green and white trees through the years. I love the big Blue Spruce tree which is outside, the best. 5. Presents are wrapped in the same theme of white, silver and gold. 6 My baking, a Coconut Cake 7. A small fruit cake. 8.9. 10. Gingerbread biscuits in many different shapes 11. Cupcakes iced in white with a white rose. 12. Meringues 13. Snowman (he is deadly, the ingredients are to die for). 14. Snowman family 15. Rum balls 16. White Christmas 17. Chocolate covered sultanas and nuts 18. White chocolates 19.Marshmallows 20. Candlelight, silver and crystals everywhere. So what are our Christmases like in Australia then? Just the same as yours I expect. With different weather. Up until about 30 years ago our celebrations were heavily influenced by our original Anglo-Celtic influences. The English style of Christmas served as our model for celebrating Christmas.......right down to the traditional roast turkey and steamed pudding in over 35 degree (centigrade) heat. Common sense is prevailing today in terms of weather. Traditional dinners have been replaced with family gatherings in back yards, picnics in parks, gardens and on the beach. Our typical Christmas menu could include seafood, glazed ham, cold chicken, duck or turkey, BBQ meats, cold deli meats, pasta, salads galore, desserts of all types, fruit salad, pavlovas, ice-cream plus Christmas edibles of all varieties such as mince pies, fruit cake, shortbread, chocolates, coconut ice etc. Christmas Eve for me will involve Christmas Carols and then attending mid-night Mass with family. Christmas Day will involve a long lazy breakfast, gift giving, then a mad scramble to call my sister and her family and various friends who live overseas. Then we will have a big family seafood and champagne lunch outdoors which somehow will extend, after a bit of rest and backyard cricket, into a BBQ dinner and more of everything. Simple and relaxed. Jingle all the way! I have spent Christmases in other countries and have experienced a white Christmas but to me, it's the people you spend the holiday season with and being at peace (with yourself, others and the world at large) that are important and that really define Christmas Spirit. I sincerely wish everyone the happiest of holidays and I will see you in the New Year. Des sends his best wishes to you too. He is busy counting his presents under the Christmas Tree apparently . Update: Some really exciting news is that a friend of Rhondas just arrived moments ago from Canada to spend Christmas with us in Australia before he heads off to see Betty in Paraguay in the New Year. It's like a bloggers tour!! Holy Moly, you are multi talented. Those cookies look so good, and even that photo collage is freakin' coordinated. I bet your closets are to die for. Oh the cookies look so good. Fruit cake and coconut stuff, not so much. My mom eats fruit cake, only person I have known to really eat the stuff instead of re gifting it. I will never forget the time my ex-husband gave her 3 fruitcakes, he was re gifting! lol Yes, people really hated my ex. My sister and I will play the piano and sing What Child is This? together for Christmas. Dogs howl. Where do you find the time?? Your plans sound wonderful. As much as I love tradition it would be nice to have a new Chistmas experience. Those are lovely pictures! I'm just getting the house decorated, though it's hardly coordinated! I have odds and ends purchased over the years, though I'm scaling back on what I put out. It's cold here, but I've never had a white Christmas. Though out in the mountains --now those are white. Tomorrow I'll take a picture and post it. And... have fun with the house guest. But just a question ...how is Stanely flat? Sounds like a wonderful, beautiful Christmas -- wish I was there to enjoy some of those goodies! Have a wonderful Christmas full of love and joy and laughter! My, my you are talented with your Christmas theme! I do think it is true that no matter where you are for Christmas, its the people that you spend it with that makes Christmas the way it is! Happy Holidays! Lilly, This was such a wonderful description of your Christmas preparations. I wish I could actually be there and see and taste some of these things :-) ....I know you guys do not have a White Christmas, for reasons of geography, but having a white,gold, and silver one is so much nicer ! If you have any cookie dough left, would you bake a little cricket bat cookie, and give it to Des on my behalf , and wish him from me ? I love your version of a white Christmas! Simply beautiful and simply elegant. The prose and pictures were marvelous. I so enjoyed this. I have a question--what are pavlovas? I like your cookies! White is a very pretty theme. On a side note... I've got some link love for ya on my latest post, "6 Helpful Entrecard Dropping Tips". Merry Christmas! Wow those cookies looks yummy Lily. I agree with you I have also spent Christmas in different parts of the world - it doesn't really matter where you are but who you are with. What a lovely Christmas post, Lilly. I love your colour coordinated baking...and it sounds like you will have a wonderful Christmas. All the best to you and your family! And you do have white Christmases there. White sand, right? Wow! You've been a busy woman. Love it all! I now would like to experience a Christmas in Australia. Maybe just one though. I so do love Christmas in the mountains. Oh and Bing....his voice is dreamy to me. We would make excellent neighbors. Beautiful collage, Lilly. And by the way, you really are beautiful! I love pavlovas. We were introduced to them when we traveled through New Zealand and Australia. Both countries said it was THEIR national treat. What an interesting mind you have, and I mean that in the nicest way! Like you we gave us traditional English style Christmas dinners/lunches, years and years ago. Even with the salads, cold meats, prawns and oysters I still manage to over indulge....my eyes are always bigger than my stomach! Thanks for dropping by my blog I will sent you an email answering your questions shortly. BTW we have been playing Bing Crosby's White Christmas every Christmas in our house since I was a baby. I still listen to it every year, Christmas wouldn't be Christmas without Bing! I ADORE Bing, and that song in particular! I loved your post, and your photo collage was amazing. You have inspired me to do some baking. HOwever, my stuff will look no where NEAR as good as yours!!!! and you know I say that with LOVE. wow Lilly your Christmas is an extravaganza and sure a sight to behold.. like your mosaic. I hope you post some recipes and instructions ...well maybe in time for next year now. Ps My mystery prize arrived today and I can't wait to try the firming mask ;) . It was lovely - thank you from the bottom of my heart ( where my chin rests and I really needed the pretty stuff). OoooHhhhh... I'm so jealous (at how perfect everything looks)!!! Well, I'm looking forward to my first summer Christmas next year in Oz (re-locating to Oz to join my gorgeous hubby in early 2009)! It'll be very symbolic in many ways... It must be weird not feeling COLD during the Christmas season! Although, I must confess it's been years since I've experienced a Bing Crosby 'White Christmas'... incidentally, my sister and brother in New York say it's snowing there - so a nice fluffy white Christmas for them across the pond (lol)! Well, I take this opportunity to spread a ton of CHRISTMAS CHEER and BLESSINGS to you and all your blogging friends!!! The collage is beautiful and your tastefully coordinated decorations and desserts look delish. You've inspired me! I think I'll create another appetizer masterpiece, perhaps with Fritos this time! Have the loveliest of Christmases and an even better New Year! Have you heard of Bucko and Champs? My very FAVORITE Christmas CD! "Frosty the Yaboo" rocks! One thing I love about hearing how other places celebrate Christmas, is the list of foods. I would love to be able to travel around the world on Christmas simple to sample all the different foods. Personally, I can do with out hearing the Christmas songs over and over again, any of them, LOL. But White Christmas is one of my favorites. I hope you merriest of Christmas' and happy new year to you, Des and of course your mother and daughter. I feel so inadequate. A colour coded Christmas! Frosty with blue sky here. With all that white you'd think you were here... in this almost sub-zero snowglobe-like state of MN where we have to add pepper to our biscotti to keep warm ;). I think I might prefer a 70 degree xmas but 95 might be a bit much for me. Have a great Christmas-nothing beats family does it? I'll take white sand over snow anyday! lol. I love your Christmas decor. But I hope you have a blessed Christmas with your family and I´ll be looking in the mail to receive our little friend...! You are so well-coordinated (color-wise and perhaps physically?!). We are having an incredibly white Christmas here. Two inches of snow yesterday, three today, three more tonight... Enough already! This year's dinner is all Italian: manicotti, Chicken Marsala, fried peppers, caponata. It's a departure from the usual turkey dinner but one the whole family approved. I love the picture sampler that you shared! You're right, we don't need snow to make it a White Christmas and we don't need snow to feel the Christmas spirit. You have it and you shared it, right here on your blog ~ how wonderful! Merry Christmas to you and yours also! I would wish you a White Christmas, but I think you have all ready solved your dilemma. In a very lovely way, too. I'm in love with your white theme. I am so glad you got your prints and that you love them. That photo collage is gorgeous! And all of your cookies look fab! Being married to a Brit, our Christmases are not unlike yours were some 30 years ago. Although, I don't think Christmas cake will ever catch on here in the states! Brilliant blog! Linked in from SITS and I'll deffo be back! I hope you have an amazing Christmas whether it is with BBQ or Turkey. You are so right it is about who you are with not what is for dinner! Fantastic post! Ah what fun!!! Thanks for sharing a part of your wonderful holiday season with us!... From the snow filled mountains of the "colonies" LOL I wish you a very Merry Christmas!!! When you get into the spirit...you REALLY go for it! Those Christmas treats look YUMMY. And it sounds like your surprise guest is bringing you even more Christmas cheer. I hope you have a marvelous Christmas day with your family! MERRY CHRISTMAS! Your pictures are beautiful. Wow do your cookies look delicious! Thank you for the greeting and I hope you enjoy the day, Merry Christmas. I would like to see what a Summer Christmas is like too. A few of my friends are in Sydney at the moment and going to Bondi Beach for Christmas. Just imagine sand, surf, sun plus Santa on top of that! Have a wonderful Christmas Lilly. I look forward to more of your great humour and fun in 2009. Goodness, Lilly, are you trying to send me into a drooling fit with all those wonderful baked goods? You sure do know how to bake! I like your white theme, as well. It's very Christmas-like, even if the weather is hot. I hope you have a wonderful Christmas with family and friends. Do try to relax between the eating bouts, will you? We all are looking forward to your next hilarious post. Don't tell me you made those delicious sweets? They look so perfect! I am sure Des will stop counting his presents once he sees those glorious cookies! And cakes! And cubs!! Never minded steamed pudding! Just look at those delicacies. It sounds like you have a wonderful 'white' Christmas! Merry, merry all your way! Thank you everyone for your good wishes for a Happy Christmas!! If I could send you some cookies and sweets through the mail I would do so!!! All the best to you, eat a lot, drink a lot and laugh a lot. We may pay for it later but we will all cope. That sounds like a lot of Christmas cheer. Although, I have a hard time picturing all that warm weather and white sand while looking out my window at all that white snow! I love your color scheme, and your ornament collection. I bet it is beautiful. I do all white silver and true red. And I collect a new snowflake ornament each year (white may be more fitting were I live). But I love white. I have even done posts about my love of white. So I suppose white sand will do. And really, Christmas IS about family and friends. . .and celebrating the birth of Christ, of course. I just love all your White Christmas goodies! I wish I had the enthusiasm for Christmas like I used to. My ex killed that 4 years ago. I hope the enthusiasm comes back one day soon. I. LOVE. Your. Style! Seriously. Merry Christmas Sweetie! Merry Christmas, Lilly! Enjoy that fabulous weather "down under"! I'll think of you when I'm freezing in New York! It has been ten years since I had a White Christmas in Breckenridge. Lovely at the time. Personally there is nothing to beat an Aussie Christmas. This year it is just us. Fantastic. No major family bust ups. Just the kids spazzing out now and again. Wow - everything looks great! Snow fell for us on Christmas Eve, which is when the Swedes celebrate Christmas, so it was perfect! Very interesting. Beautiful pics, too. I've always enjoyed celebrating Christmas in Florida. I figure that there are probably palm trees in Bethlehem, too. Have a very, very happy Christmas. I loved looking at your cookies. I wish I had the energy to cook some. Your Christmas sounded great from all the pics and the preparation. Mine this year - well, I called it "Casual Christmas". That was a great post on your White Christmas--Australia's style. I love your decor and all your baked goodies. You must like cooking, for which I'm not fun of doing. Your Christmas is slightly different than here because of your climate. I have yet to see anyone picnicking or barbequeing at Christmas time. I agree with you that the most important about Christmas is being with love ones. Hope your had a wonderful Christmas. Sigh...I love all things white. If I posted a collage your eyes would probably bleed! Every single Christmas ornament is different and includes a 16 year old cookie, Marilyn Monroe and a basketball playing snowman. My daughter and I buy a new one every year. I wouldn't trade it for the world, however when I look into my solo future, I see nothing but silver and white!! Yes it is strange (as a Pom) to think of Christmas being in the middle of summer...but you're right, it's the Spirit of Christmas, the Love that is important, not the location. I haven't heard the version of White Christmas on the YouTube vid...Bing's vocals are the same, but the backing is different (lots of Disney choruses) ~ Great though. I remember talking to George Chakiris (leader of the Sharks in the film version of West Side Story)...he was in the film "White Christmas" with Bing and Danny Kaye...and Rosemary (Aunt or mother of another 'George' - Clooney. Anyway, George Chakiris told me lots of stories of working with the greats...including Marilyn Monroe...I was totally overwhelmed.